Purpose: Test for the likelihood of a patient responding positively to a spinal stabilization program. Performing the Test: With the patient lying prone on a plinth with his legs fully resting on the ground, the examiners places a posterior to anterior pressure in the lumbar spine. The patient then lifts his legs off the floor. The examiner applies pressure against the lumbar spine again. The patient can hold onto the table in that position if comfortable. Pain is documented initially after the pressure is exerted and once again after the patient’s legs are off the ground. A positive test is considered if the patient has pain with pressure in the resting position, and the pain decreases in the active position. Diagnostic Accuracy for success with stabilization exercise program: Sensitivity: .72, Specificity: .58, +LR: .48, -LR: 1.7 ("Preliminary development of a clinical prediction rule for determining which patients with low back pain will respond to a stabilization exercise program"; it should be noted that the participants of the study had non-radicular low back pain). 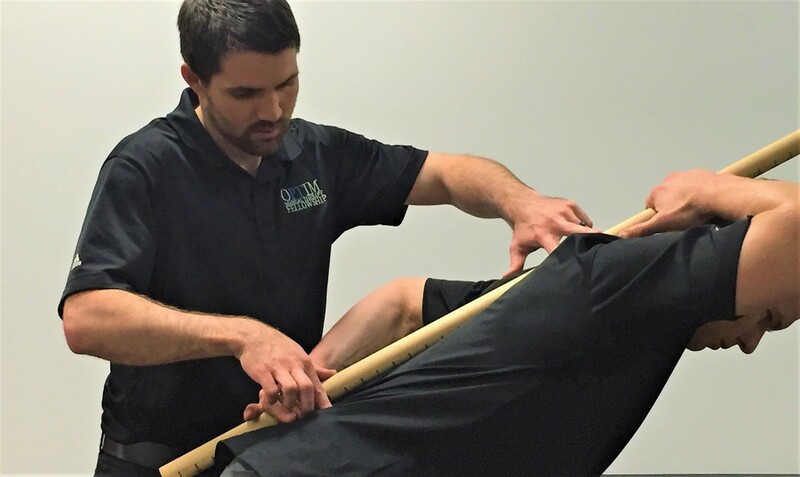 Importance of the Test: Having poor stability in the lumbar vertebrae can predispose you to a multitude of injuries, including spondylolithesis, spinal cord lesions, and lower extremity musculoskeletal imbalances. The position with legs held off the table activates the hip and lumbar extensors, which help to stabilize the hypermobile segment and can aide in determining how much a core stabilization program would help the patient. Some texts show the patient lifting the legs even to the plane of the table, while others display the patient simply lifting the legs off the ground a few inches. While both methods accomplish the goal of activating core musculature, the position with the legs lifted to the plane of the table may offer additional stimulation. In that elevated position, the weight of the legs has an increased moment arm relevant to the torso. This increased torque places higher muscle demands on the core, eliciting a stronger contraction. By looking at this Diagnostic accuracy, it is hard to make conclusions about lumbar instability solely off this test. It is important to cluster these findings with a + Gower’s Sign, Instability catch, aberrant motion findings, and more. Look under the research articles page for more information about lumbar instability testing! Hicks G, Fritz J, Delitto A, McGill S. "Preliminary development of a clinical prediction rule for determining which patients with low back pain will respond to a stabilization exercise program." Arch Phys Med Rehabil 2005; 86: 1753-1762.